We professionally edit your copy for grammar, spelling and clarity. We can also write articles and help you with story ideas to develop high quality content. We then research, interview, write and edit these stories to ensure your company newsletter is communicating effectively. The design of your newsletter is critical and should reflect your corporate style and the image you wish to project. 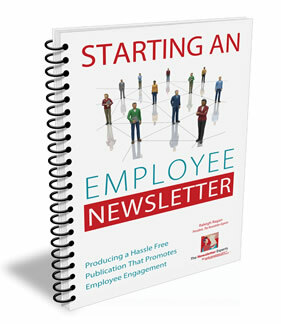 Count on us to quickly develop a totally new employee newsletter or improve an existing publication. We ensure your newsletter design communicates who you are while effectively conveying your message. We have the experience and systems to guarantee your newsletter is completed and distributed in a timely manner. By creating a project schedule and working with your staff, we keep the newsletter on track from start to finish. The result is a high-quality, on-time publication. We handle everything from start to finish to ensure the final publication meets or exceeds your expectations. We can provide a PDF, HTML or digital (flip page) publication. Once your newsletters are printed, we can mail them in the most cost-effective manner. You can choose to send it first class, presorted (bulk) or if you prefer, we’ll deliver the finished pieces directly to your office(s). The publication can be shipped to your office(s) or mailed directly to your employees in the most cost-effective manner. We can email your employee newsletter and track readership or provide the final publication for you to deliver however you choose. For more information or an immediate quote, click here or call us at 636.256.0050 to discuss your needs.